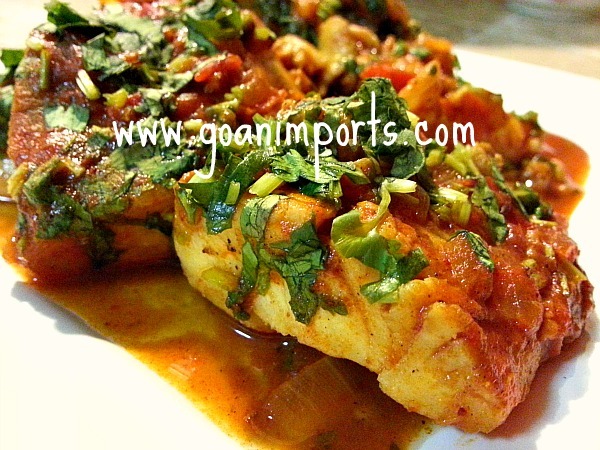 Its Friday and I thought of sharing this Spicy Tilapia in Recheado Curry recipe also called as Guisado De Peixe which is prepared with any fish of your choice. Friday was a day we did not eat meat as the Catholics believed that Jesus died on that day and it was a way to mourn his death. Funny as it may sound, till today on Friday’s my mom does not buy anything new for the home. Be it furniture, clothes, jewellery, electronics or stuff that I wouldn’t have thought twice. Unfortunately for her I don’t follow with those traditions. I am not sure if it’s a good or a bad thing as I would love for my sons to grow with some sort of traditions as I grew up with. Apart from my reasoning, this dish of Spicy Tilapia in Recheado Curry is a great dish that you can enjoy the day made or the next. Perfect to impress your guest of your culinary skills. The Spices and the sourness from the Goan coconut vinegar makes the fish taste exotic even though it is so easy to make. 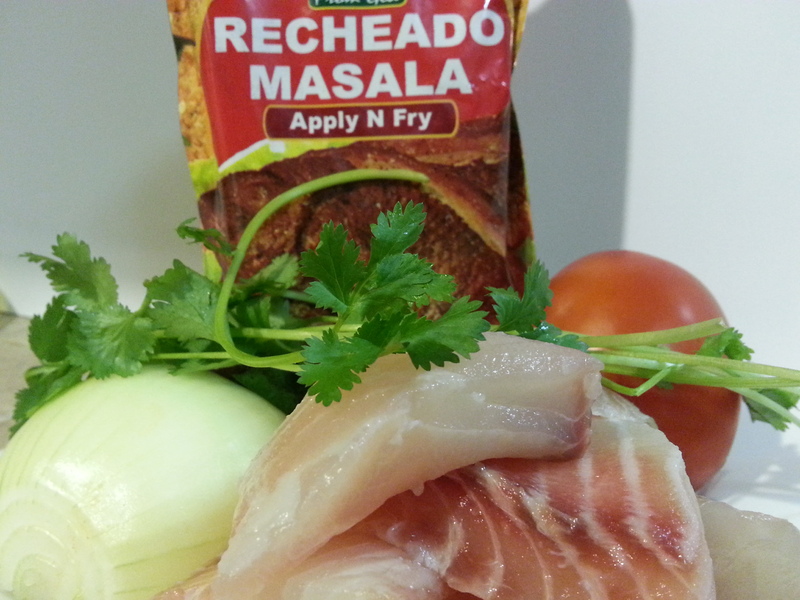 Recheado Masala is a ground spice mix made with red chillies, ginger, garlic, turmeric, cumin, cinnamon, peppercorns, cloves, tamarind, salt and sugar that is ground in pure coconut vinegar. Cut the fish in 2″ pieces, wash, apply salt and keep aside. Heat oil, add the diced onion and saute till translucent. Then add the tomato and cook till it softens, put the recheado masala, diced garlic and saute for a 1 to 2 minutes. Add in the water, season it with salt and cover and simmer for 2 to 3 minutes. This helps the curry to be more flavorful ( A trick I learned from my mum, weird but it works). Add the fish, salt to taste if required and cook covered for 5 minutes on medium heat. Open and cook uncovered for another 3 to 5 minutes. Add chopped cilantro. 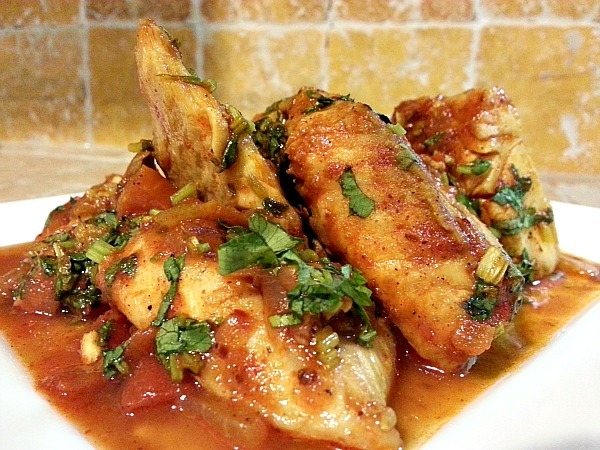 You can server this Spicy Tilapia in Recheado Curry with white or brown rice or eat it with bread. Hope you enjoy! Funnily enough, we have tilapia Fridays in our household for similar reasons. My father unlike me was a devote Catholic and the tradition has stuck. Its fun and a good way to honour him. Can’t wait to try the recipe. In Canada many Indian spices and foods are readily available so we enjoy trying them. One of the greatest gifts our parents give us is traditions which is priceless. I bet you father would be proud :-). I hope you try it. Merry Christmas! Thanks Vinma. Let me know how it goes. Thank You the Paul. If you are based in the US you can check out Goan Imports website. Paul I forgot to mentions its not too spicy I would say Medium spiced and if you add lesser then my suggestion in the recipe it would be less spicier. These spices are imported from Goa and so the vinegar is not available in the US but its an important ingredient in the recipe. I do have a previous write up about more info on how the vinegar is made. Lovely outcome but I don’t think the masala is available over. Yet since you have mentioned what constitutes the mixture, I am tempted to try. Thank You navane64. If you are based in the Us you can check it out at Goan Imports website.